Conventional BI and reporting systems take too long to implement and are too inflexible to provide the kind of real-time, drill-down, ask-any-question data analysis which managers need to change the rules of the consumer products analytics game. Sisense offers an entirely new way to deliver fresh, actionable intelligence to managers in organizations of consumer products. 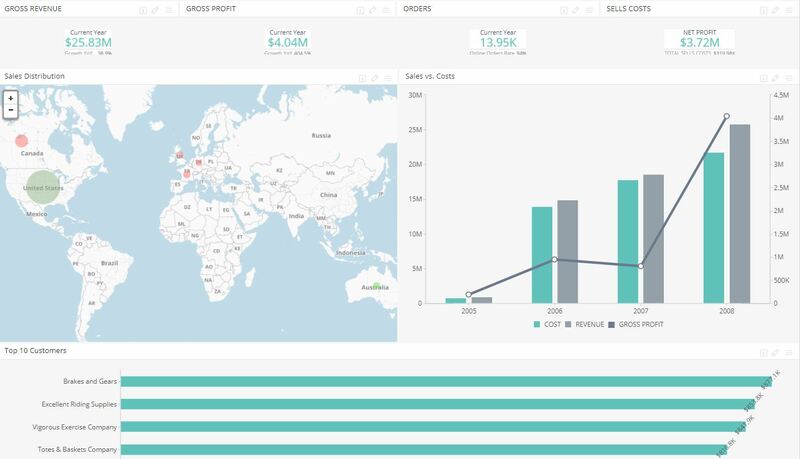 No other BI solution in the world lets non-techies take large amounts of scattered data and create beautiful BI dashboards as quickly or as easily. That's why Sisense is called the "Robin Hood of the BI world" - we bring data justice to everyone, not just the technical experts or big companies with endless resources. Our secret sauce is the powerful technology we use to design our BI software so users don't need to write complicated code or rely on IT , so anyone can build a dashboard from multiple large data sets, using any device. Unlike other BI vendors, Sisense is a business intelligence data visualization software and no additional or third-party software is required. See a live Sisense BI dashboard here.